Nanjing Amity Printing Company ("Amity Printing") is China's sole Bible printer and a controversial one. Located in the city of Nanjing, Amity Printing was created in 1985, four years after Project Pearl exposed to the world the lack of Bibles and the persecution of Christians in China. Amity Printing began operating in 1987 but the Bibles that Amity Printing initially printed were used to arrest underground church Christians. To buy Amity Bibles at the government-controlled Three Self churches - the only places where Amity Bibles were and still are sold - they were made to show identification and/or tailed until their underground churches were discovered and its members arrested. According to Amity's figures, its annual Bible output initially increased until 1996, then declined until 2002, and then began a steeper climb (above). In 2008, Amity completed a new plant with an annual printing capacity of 12 million Bibles that raised the total annual printing capacity to 18 million Bibles, the world's highest. 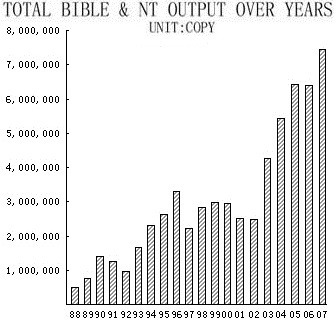 In 2011, Amity reported that by the end of 2010, 80 million cumulative "Bible and NT" (New Testaments) had been printed and that of the first 54 million copies, 43 million (80%) had been sold inside China, giving the impression that Bible printing was going through the roof and that most - 80% - of the Bibles were for the Chinese Christians inside China. If you look carefully again at the figures above, it reported 80 million Bibles printed cumulatively by 2010 but provided the domestic vs. export data only for the first 54 million Bibles, printed by the end of 2006. In 2011, why did it choose to omit the domestic vs. export data for the preceding 4 years of 2007, 2008, 2009 and 2010?